Mrunal Patil has expertise in designing, formulating and evaluating lipid carriers for the treatment of fungal diseases. She has developed lipid-drug combination after years of learning fungal drug resistance patterns in K.E.M hospital and designing formulations at Institute of Chemical Technology. She has been awarded Newton Bhabha fellowship for carrying out research work in mechanism elucidation of active aminolipid carrier at Nottingham University, UK. She has a keen interest in design and developing safe, efficacious lipid-based Nano-formulation for resistant infectious diseases and is looking forward for more challenges in the said field. Management of invasive candidiasis in immune compromised patients exhibits a major challenge for the clinicians since, antifungal monotherapy becomes ineffective. Moreover, switching between new antifungal agents and drug combinations intensify the situation by creating parallel adverse effects and drug toxicities. Furthermore, combining two drugs in a unit dosage form bring pharmaceutical challenges. This in turn, decreases the pharmacoeconomic efficiency in treatment associated with drug resistant candidiasis. Hence, we suggest replacing drug-drug therapy with drug-active lipid therapy,wherein the active lipid is a synthesized aminolipid based multifunctional carrier (PFA 18) which exhibit combinatorial synergy with existing first line antifungal agents like fluconazole and polyenes such as amphotericin B against clinically isolated drug resistant Candida species. As suggested by our computerized simulation studies, this lipid forms a strong hydrophobic and van der Waals interactions with antifungal agents supporting its stabilization into a nanoemulsion system. Sensitivity testing against gene deleted S. cerevisiae library also represented a possibility of effect on mitochondrial outer membrane and cell membrane of yeast. These activities were confirmed by flow cytometric mitochondrial assay and topographical cryoimaging studies. In vitro cytotoxicity confirmed that PFA 18 alone and in combinations with fluconazole/ amphotericin B did not show any cytotoxic effect on Hep2G or HEK cell lines. 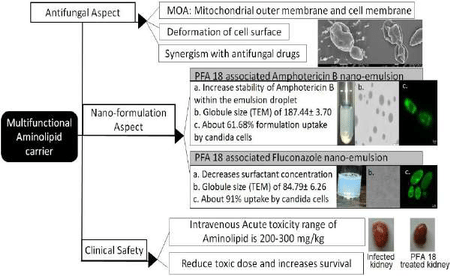 Moreover, in vivo acute toxicity testing of PFA 18 showed that its toxicity range lies between 200-300 mg/kg. In vivo efficacy studies in swiss albino mice model infected with multidrug resistance candida revealed that, PFA 18 played a major role in reducing drug dose, and toxicity thereby increasing the probability of survival.